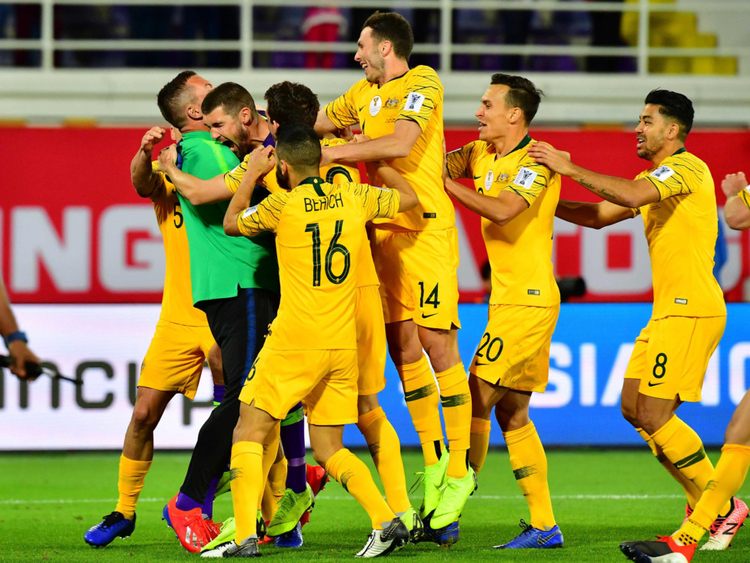 Dubai: Australia and Uzbek-istan fought out a battle of attrition in Al Ain before Mathew Leckie finally proved to be the hero from the penalty spot as the Socceroos prevailed 4-2 in the shoot-out in the Round-of-16 match of 2019 Asian Cup on Monday. There were a handful of flag-waving Australia fans in the shadow of the Jebel Hafeet at the Shaikh Khalifa International Stadium but they had little to cheer as Graham Arnold and Hector Cuper set up their respective teams looking to avoid defeat rather than go for the win — with the scoresheet remaining barren after 90 minutes. Australia, the defending champions, have left a lot to be admired so far in the tournament, losing 1-0 to Jordan before scraping past Syria in Group B to make it to the knockout stages. Uzbekistan have also failed to light up the competition, narrowly beating Oman before going down to Japan in their final Group F match. Australia seemed to get the better of the earlier exchanges with skipper Mark Milligan trying his luck from distance but the youthful Uzbeks seemed content to soak up the pressure and hit on the break. Milligan had to look sharp to mop up one such assault and carefully shepherded the ball back to keeper Mat Ryan. Ryan Grant, the man with the dodgiest haircut in the tournament, caused havoc in the Uzbekistan area after 12 minutes with a long throw but goalkeeper Ignatiy Nesterov was on hand to clear the danger. Eldor Shomurodov was next to tee up an effort at the other end but Australia were back in numbers as both sides defended deeply. Shots came in from long-range from but there seemed no danger of the deadlock being broken — a tame free-kick by Tom Rogic into the Uzbek wall summing up a turgid first half. The second half began in a similar vein as both sides knocked the ball around, probing for an opening rather than play with any urgency. Jamie Maclaren had a couple of half-chances, but defiant defending and safe hands from Nesterov kept the scores deadlocked after 90 minutes. Extra time would help neither side given the quick turnaround in the fixture list, but no one was willing to grab the game by the scruff of the neck and provide the breakthrough and another 30 minutes were signalled by Qatari referee Abdul Rahman Al Jasem. Vietnam had already sent Jordan home on penalties and this match looked to be heading for a shoot-out too. On came the penalties and after a save apiece for Ryan and Nesterov, Marat Bikmaev failed to convert and Leckie hammered home to send the Aussies to the quarter-finals and the Uzbeks home.